Gurukul Kangri University MA, M.Sc 1st Year Examination Results 2014 declared: -The Gurukul Kangri University Haridwar has recently declared the results of MA (Master of Arts) and M.Sc (Master of Science) 1st Year Examination 2013 Results. So now all the students of MA and M.Sc 1st Year can check their results through online by the official website of Gurukul Kangri University. The Examination was held on Last year 2013 and now the university declares results. The Gurukul Kangri University is one of the leading Universities of Uttarakhand and it is situated in the Delhi Road Haridwar Uttarakhand. There are many students are studied from the University every year. And many students from India as well as abroad are study in this University. So now the MA and M.Sc 1st Year examination results of University has declared. And here below I am giving you weblinks to get your results online from here. So just click on below given links and then you will be redirected to the results page, after that type your roll number on given section and then click to submit. After all you will be able to check your results and marks details. 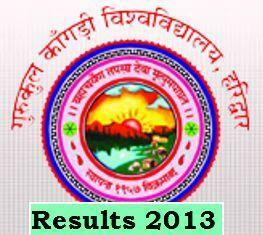 Click here to get M.Sc 1st Year Results of Gurukul Kangri University Haridwar. For more details you can also check the official website of Gurukul Kangri University Haridwar (www.gkv.ac.in).